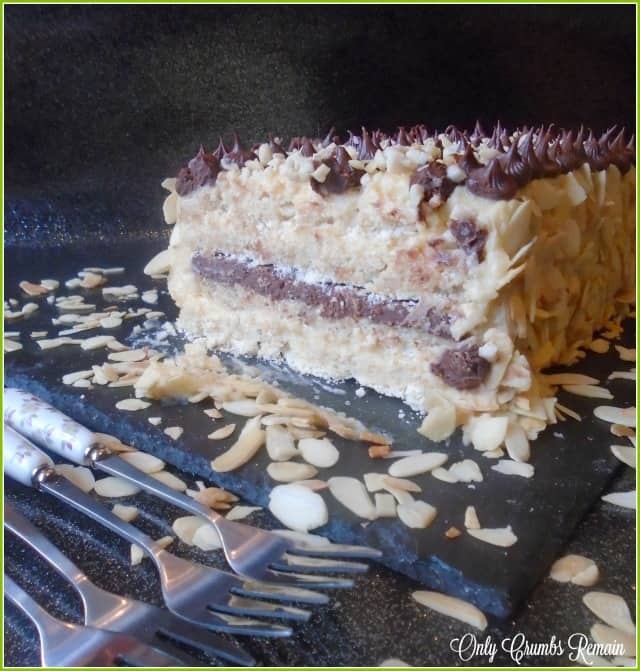 A classic French gateau consisting of dacquoise, buttercream, chocolate ganache and nuts. As the component parts of this dessert can be made ahead of time, it’s a delicious choice for those special dinner parties and family celebrations like Christmas or anniversaries. Allow me to introduce you to Marjolaine. She’s a French layered gateau, with a certain je ne sais quoi. She could possibly be the poshest, most sophisticated and elegant dessert here on Only Crumbs Remain. With her four layers of dacquoise, French buttercream, chocolate ganache and a whole heap of nuts she’s certainly what you might call high-maintenance, but boy she certainly can command presence in a room. 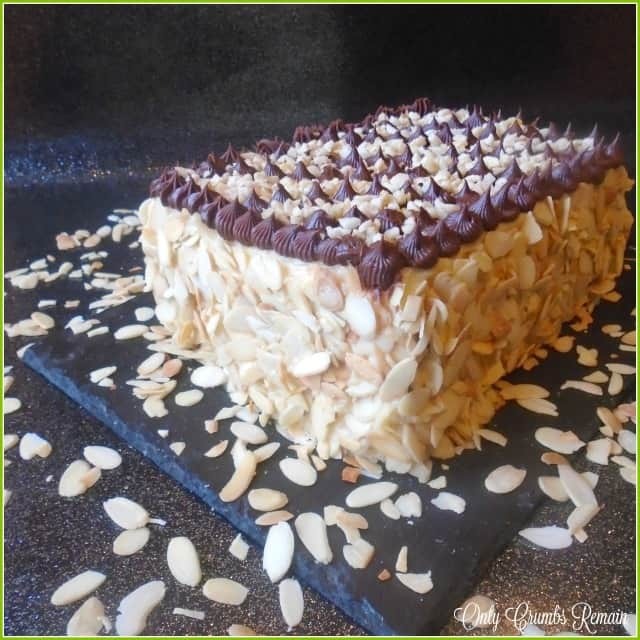 Marjolaine certainly isn’t one of those desserts that you might choose to rustle up in a few minutes for a mid-week treat or for when your children’s friends come for tea after school. But rather, this French dessert is perfect for dinner parties where you’re aiming to impress or for family celebrations like Christmas and anniversaries. I have to admit that this French dessert isn’t the usual sort of sweet treat I would make in our Only Crumbs Remain kitchen, but having watched GBBO’s dessert week I felt compelled to try. The six remaining bakers in the GBBO tent were faced with making a family sized roulard as their signature bake (though weren’t they really Swiss rolls having been made with sponge rather than meringue? ), the Marjolaine set by Mary as the technical bake and a batch of 24 mini mousse cakes as their showstopper where some of the bakers looked to be drowning amongst sheets of gelatin. On the face of it this French dessert is quite complex, but after separating the bake into its component parts it’s not overly difficult. A large batch of classic French meringue is whipped up before ground toasted nuts are folded through to create the dacquoise. Once baked, the dacquoise is sandwiched together with French buttercream which incorporates ground praline. The buttercream is also spread over the upper surface and sides of the Marjolaine. A layer of rich chocolate ganache can be found through the centre layer of the dessert once it’s sliced into. The remaining ganache is then piped on top of the dessert creating sections for slithered pistachios and chopped hazelnuts to sit, though I’m sure you have noticed that our Marjoliane is only topped with chopped nuts having been unable to source slithered pistachios easily and running out of available time to prepare the pistachios we had. Toasted flaked almonds finish off the sides of the Marjolaine. Besides omitting the pistachios from the top of the gateau, I also substituted the French buttercream for something easier and which wasn’t made with egg yolks. French buttercream is made with egg yolks which has hot syrup whipped into it, followed by butter, and in this case ground praline. As Mr E often has concerns about undercooked eggs, which no-doubt harks back to the days of Edwina Currie in the late 1980s, I chose to set our egg yolks aside for another bake and made a regular frosting instead, sweetened with the ground praline rather than the usual icing sugar. You may disagree, but when making something a little special we often aim to purchase higher quality ingredients than the standard. In this bake we chose to use Tesco’s Finest chocolate, using both the milk and plain chocolate for our ganache. The rich smooth flavour of the chocolate was the perfect counterbalance to the sweetness of the dacquoise and buttercream. And the result? Although this dessert clearly took some time to pull together, it certainly packs a punch in terms of flavour and presence. Each of the elements were fabulous together from the crisp melt in the mouth dacquoise, the creamy sweet buttercream, the delicious rich chocolate ganache, and of course the plentiful nuts. Surprisingly Mr E, who is a self-confessed meringue-phobe which I commented upon in our recent Lemon Meringue Pie (with thyme pastry) absolutely loved this gateau as much as I did! Let’s get to it and baaaake! dinner parties and family celebrations like Christmas or anniversaries. Hands on time: about 2 hours Cook time: 45-60 mins Yield: 1 layered gateau, about 9-12 slices depending on how it’s assembled (see recipe). 2 x Swiss Roll Tins Measuring30cm x 20cm. Alternatively consider using flat bottomed roasting tins of the same or similar dimension, see note a below. 1. Prepare the nuts for the dacquoise. If using blanched almonds and hazelnuts, pulse the nuts in a food processor until they are finely ground. Place about a quarter of the nuts into a dry frying and set over a low to medium heat. Move the ground nuts about frequently with a wooden spoon until they are lightly golden. Tip the toasted nuts into a suitable bowl and repeat with more of the nuts until they are all toasted. Set the nuts aside to cool. The cooling process will be sped up by scattering them on a flat baking tray.2. Preheat the oven to 150c / 140 Fan / Gas 2.3. Prepare the swiss roll tins. Grease and line the swiss roll tins with greaseproof paper.4. Make the dacquoise. Ensure your hands, mixing bowl and whisk beaters are free of fat and scrupulously clean. Place the egg whites into a large bowl and beat until they are white, frothy and thickening. Slowly add the 200g of sugar a spoonful at a time whilst mixing. The meringue will become very thick and glossy. Add the 100g of sugar and cornflour to the ground toasted nuts and mix to combine. Scatter the nut mixture over the meringue. Use a spatula or large metal spoon to gently fold this in.5. Bake the dacquoise. Divide the daquiose mixture equally between the two prepared swiss roll tins. Level it out. Place the tins into the oven. Bake for 45 – 60 minutes until lighty golden and firm to the touch. Turn the oven off, leaving the trays in the oven and the door slightly ajar until completely cooled. Once cold remove from the oven and turn out onto a sheet of greaseproof paper. Cover until required.6. Make the ganache. Pour the cream into a small heavy based pan and set over a low heat to warm. Meanwhile use a small sharp knife to break the chocolate into small pieces. Place the chocolate into a good sized bowl. Once the cream is hot, though not boiling, pour it over the chocolate. Stir with a metal spoon until the mixture is smooth. Set aside to cool and thicken. 7. 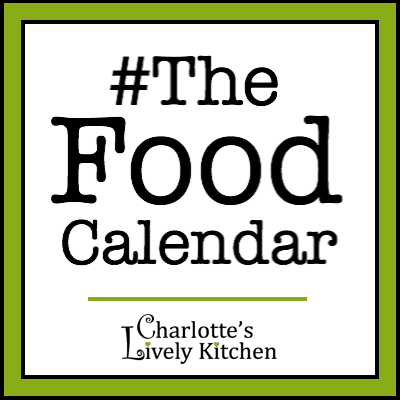 Toast the flaked or blanched almonds for the praline. Place the nuts for the praline into a dry frying pan. Set it over a low to medium heat. Stir frequently with a wooden spoon until they are lightly golden. 8. Prepare to make the praline. Line a baking tin with greaseproof paper.9. Make the praline. Place the sugar and water carefully into a heavy based pan, avoiding getting sugar crystals up the side of the pan. Set the pan over a low to medium heat. Once the sugar has completely dissolved increase the heat under the pan and allow the syrup to boil. You’re aiming for the syrup to reach caramel stage, a rich golden brown colour. It’ll be 170c / 330f on a sugar thermometer. Take the pan off the heat. Add the toasted almonds and stir with a wooden spoon to combine. Pour the mixture onto the prepared baking sheet. Use the back of the spoon to spread it out. Set aside to cool. REMEBER THE SUGAR / PRALINE IS VERY HOT!10. Grind down the praline. Once the praline is cold. Break it into pieces. Place into a food processor and blitz until the praline is a fine powder. Alternatively use a pestle and mortar (or even the end of a rolling pin and bowl) to create a powder from the praline.11. Toast the flaked almonds for the gateau decoration. As before, place the nuts into a dry frying pan. Set the pan over a low to medium heat and allow the nuts to toast turning a light golden colour. Stir frequently with a wooden spoon. Set aside to cool.12. Make the buttercream. Place the butter into a bowl and beat until smooth and soft. Add the cream cheese and incorporate until smooth. Avoid over working the mixture as it can become overly soft. If it does, place it into the fridge to firm up a little. Add the ground praline and mix until well combined. Taste. Add a little icing sugar if required. 13. Begin the assembly. Cut each dacquoise in half either length ways or width ways depending upon the size of your serving plate and the number of slices you want (you will get more slices from the gateau if the dacquoise is cut length ways). Place one piece onto your serving plate. Use a pallet knife to spread some of the buttercream onto that slice. 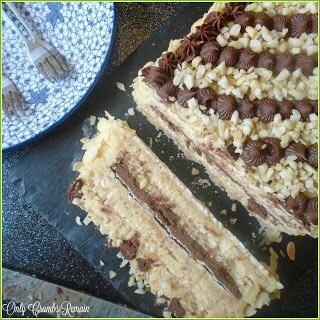 Top with a second dacquoise. Spread with a layer of chocolate ganache. Top with another piece of dacquoise, a layer of buttercream then the final piece of dacquoise. 14. Complete decorating the Marjolaine. Spread the remaining buttercream over the top and sides of the gateau. Use a pallet knife to smooth it out. 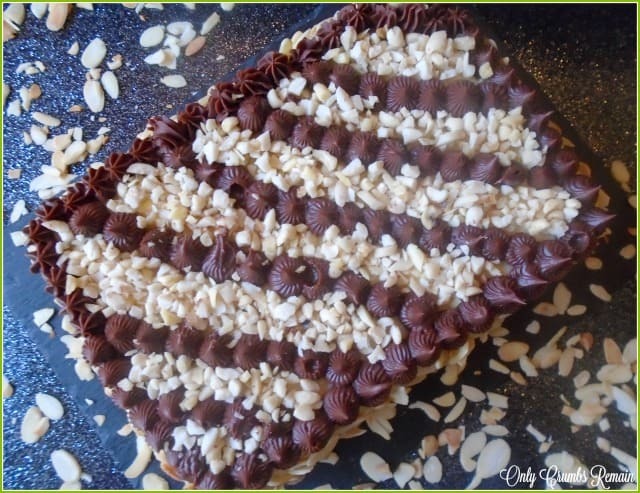 Apply the toasted flaked almonds to the side of the gateau. Fill a piping bag fitted with a star nozzle with the chocolate ganache. Pipe small rosettes around the top edge of the gateau. Pipe 7 or 8 diagonal lines, consisting of small rosettes over the top of the dessert. Fill each compartment with the chopped nuts. Consider alternating the nuts with slithered pistachios. a) We baked our dacquoise in flat bottomed roasting tins measuring 33cm x 24cm. As they were a little larger than swiss roll tins the dacquoise ingredients were increased to: 160g each of almonds and hazlenuts, 267g + 133g caster sugar, 33g corn flour, 8 egg whites. The recipe produces sufficinet buttercream etc to assemble the slightly larger gateau. b) Check the nuts regularly whilst they are being toasted as they can easily burn. c) Each component part can be made ahead of time and stored until ready to assemble. Keep the dacquoise in an air tight container. The buttercream and ganache can be kept in the fridge, covered, though they will need a thorough stir before using. d) If the daquise cracks when cutting it in half, place that as one of the centre layers. e) If the chocolate ganache is a little thick to spread / pipe when you are ready to assemble the gateau, simply place the bowl over a bain marie for a couple of minutes until it is a little slacker. f) Once assembled store the Marjolaine in the fridge until required. g) The dessert will keep for a couple of days in the fridge. Wow Angela, what a fantastic job, your marjolaine looks beautiful. I love reading how you make your cakes, your instructions are always clear with plenty of advice. Awe thankyou Sarah, that means such a lot to me 🙂 I try to provide as much info as I can to make it clear (hopefully) how it's made….especially for those who don't bake often. I often think that vague recipes often result in disappointing bakes. I always find your recipe posts are great, which lovely clear instructions. Thankyou Midge 🙂 I'd imagine a dairy and eggfree version would be great and relatively straightforward given how good aquafaba is. Wow you've done an amazing job with this it looks perfect! Awe thankyou Eb 🙂 Glad you liked the multi-tasking with the hairdressers appointment 😉 the time I spent away from the kitchen was perfect allowing everything to cool and firmup, and prevented me from being a little impatient in assembling it too soon. Wow Angela – this is stunning! I can't imagine having enough time to make this so I'll just enjoy yours from afar!! 🙂 Thankyou Cathy, but the bakers in the tent only had a limited amount time to play with, which personally I find defeats the object of enjoying baking when you're working against the clock. That it absolutely stunning. Well done for trying something completely different to you usual bakes as you've mastered it! Awe thankyou Hannah. Like you, I love baking along with GBBO as it gives me a great excuse to try someting new and learn different techniques and try differenct flavour combos. That is one heck of an epic cake, Angela! And great to have at Christmas too, instead of the usual heavy fruitcake (although I am a lover of rich fruit cakes). I'm Pinning this, and will also put it on my to-veganise list. Yummy! It'd certainly make a great dessert for Christmas Nico and a lovely alternative for those who don't care for fruit cakes and the traditional christmas pud (though like you, i love rich fruit cakes). I have to admit i was very tempted to try to make a vegan version of it with aquafaba, it'd be a fairly easy one to veganise now given how fab that liquid is. Surprisingly, it wasn't fiddly at all. I think the area which took a little patience was decorating the sides and the top with the different nuts and trying not to get them in the wrong places or all over the piped ganache. But even that just took 5 or 10 minutes. My words, it really did taste yummy, even hubby enjoyed it (well it was daquoise and not meringue 😉 ). I wish I'd made regular buttercream for mine too. I found mine far too rich and sweet! Yours looks lovely. Yeah, I can imagine all of those egg yolks making it really rich. Well done… This looks great! I have been toying with making one too (as they are naturally gluten free)…… but Miss GF is insisting on a roulade! What a dilemma to have… Marjolaine or roulade……. Maybe I could just try a slice of yours? !